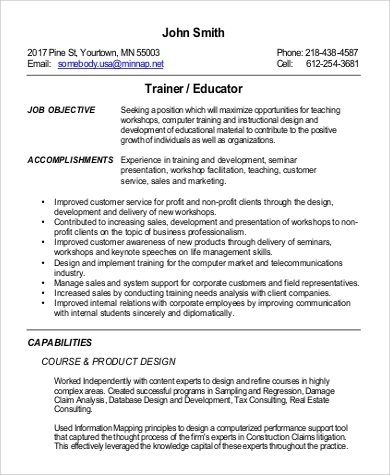 A functional resume is one of the four types of resume together with chronological resume, combination, and targeted resume. 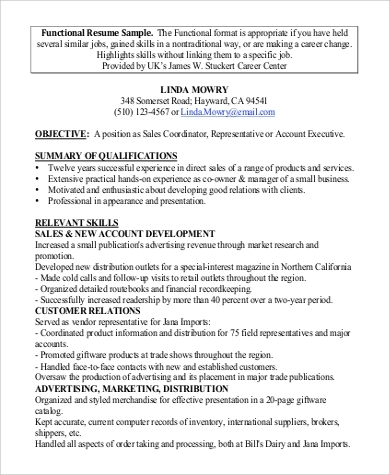 These types of resume are used depending either on the job that you are applying for or the strengths and experiences that you have as an employee. 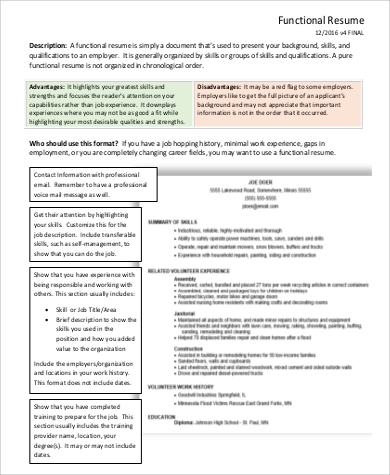 Functional resumes are primarily used to give a strong impact on your skills and abilities. It gives more importance to what you can do and the services that you can provide to the company by using your skill set. 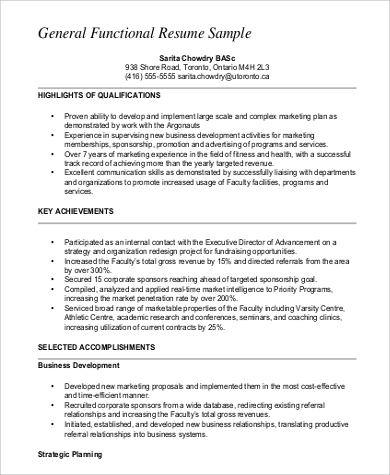 We have Sample Resumes that you can download. 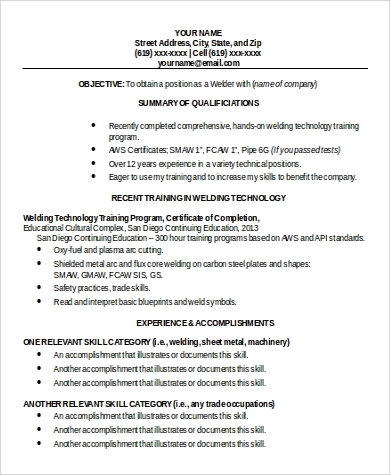 If you’ve identified that a functional resume is not right for you, the link provides other samples that might fit your needs. 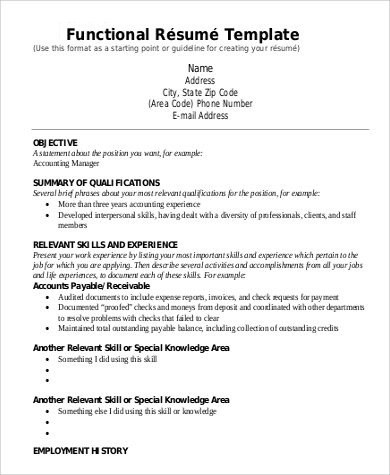 Functional resumes give the employer an idea of your skills first before going through your employment background. 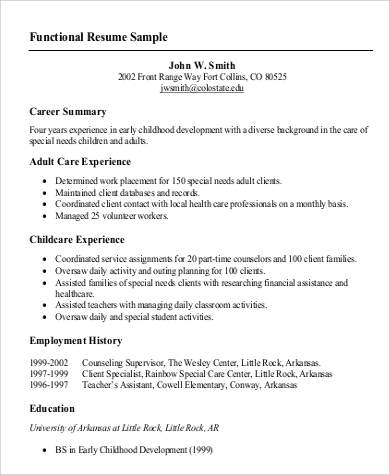 You can see Sample Functional Resumes on the link and you actually can download them for your personal use. 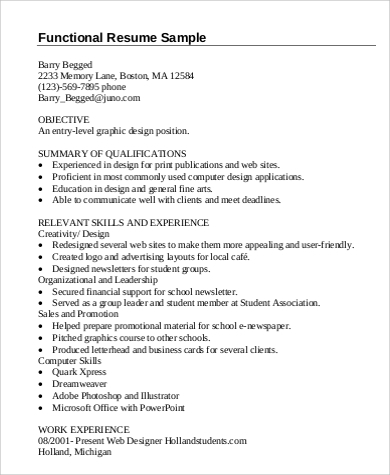 Do not hesitate to use this kind of format if you have various work experiences as you still need to provide your professional background on the latter part of your resume. It is better for you to start your application the right way than show the less appealing parts of your work history. Sometimes, once employers see that your work background is not matching with the job requirements of the position that they can offer, they tend to not look on the other parts of your resume. An employee who wants a change of career path. Indirect work experiences can make your prospect employer select other applicants who have undergone jobs that are directly related to the department or position that you are applying for. Being able to provide your skills first can make them change your mind especially if the skills that you have provided can very much add value to the workforce of the company. A fresh graduate. As an applicant with no professional experience, you need to use your skills and the abilities that you have acquired in school. You need to let the human resource personnel see that your lack of job and professional experience can be replaced by your skills. This will help them understand that you are willing to do the job and is ready to learn as you already have the skills needed and the opportunity to get the job is the only thing that you are waiting for. An employee who does not have a strong work background in terms of employer relationship. 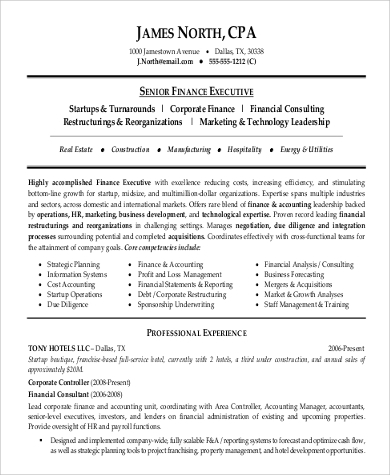 If you have only worked for an employer for a few months or there are relatively long time gaps between the jobs that you’ve had, creating this kind of resume is the right thing to do for you. First, you do not want the employer to see that you cannot stay on a job for a long time or it is all right for you to have no job for a long period of time. Second, stating your skills first can let them assess if the reason for you leaving your past jobs is that your skill sets are not appropriate for your previous positions in your past companies. 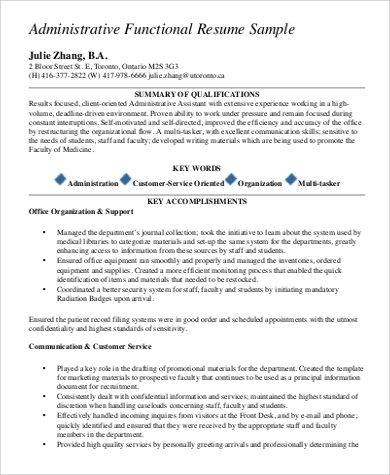 You can look at our Functional Resume Samples to know more if it is appropriate for you to use.